For the month of June, after Shannon, who’d been in the field just about every day in May, and while waiting for Lynn to start full-time for the rest of the season (July 1st! ), I’ve been back working in solo mode, which has been, surprisingly to me, a little strange and…unfamiliar. Right now, there are several great people sharing the tiny farm experience (TFE ;) each week, but coming on single days. Here, with Lynn and Raechelle (Tuesdays! 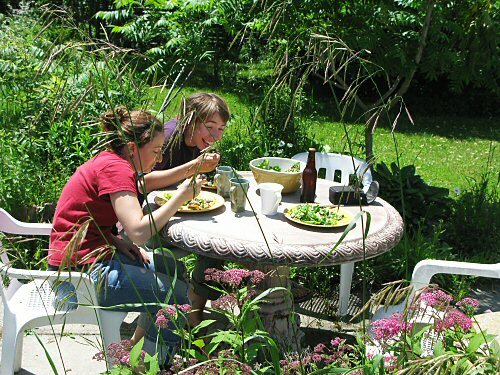 ), we take an extended Endless Salad lunch break in the backyard. It’s as relaxed and fun as it looks. This, I think, is how it SHOULD BE, a laid back mix of fieldwork and practical leisure. It’s a lot different than the 10-12-hour, garden-obsessed days of the first 3-4 start-up years, when I worked largely alone. After working with Conall right through the season last year, I realized that my original solo mission, one-farmer-one-field mode had…changed. Evolved. To continue to grow on this tiny farm, it seems I’ve taken the path that needs not more production acreage or machinery or straight, head-down hours of labor, but simply more happily committed PEOPLE. Hmmm… Not a brand new discovery, but driven home over the last month. An interesting twist on tiny! Why don’t you get in a few pictures too? I’m always left wondering what you look like and if you’re having as much fun as everyone else. Now that’s a cute TFE photo. Makes me nostalgic for my wonderful tiny farm garden lunch experience on Tuesday. i noticed the comment wondering why you, mike, are never in the photos. we’ll have to remedy that. or people will discover that you don’t really exist. it’s kind of like you’re the ghost of the farm…there’s even a plate set for you, but no one ever sees you. creepy. but kind of cool.